The ultimate in luxury and comfort! Send us an email at Contact Us for a custom price quote! Year Fitment: 2008-2015. 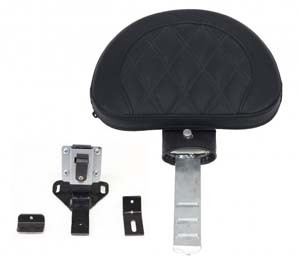 Will work w/ OEM or Saddlemen Backrest. 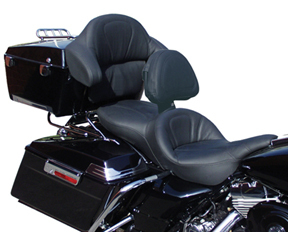 **NOTE: TRIKE MODELS will not allow for use of our Driver's Backrest. 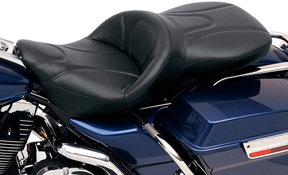 Accommodates the Harley-Davidson® Back-Rest Option. 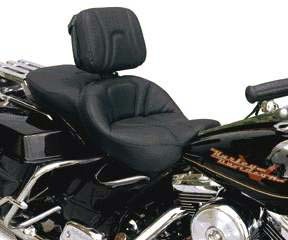 NOTE: This optional backrest is compatible with the Road Sofa LS, but will not work on Harley-Davidson Trike models. 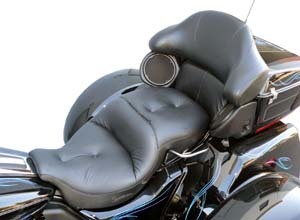 RDSF-67PC: Passenger Backrest Pad Cover with Road Sofa styling. 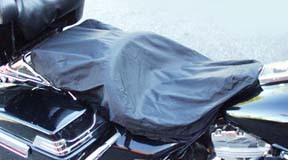 Gives your bike a unified look, matching seat cover material and patterns (available as noted for Harley-Davidson Touring Models equipped with a Tour Pak).Fits: FLHR, FLHT, FLHX & FLTR (TOURING MODELS) - EXCLUDES TRIKES. Year Fitment: 2014-2015. 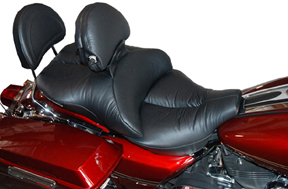 Road Sofa: There's nothing like touring on an Electra Glide or Trike. Now with the addition of a Saddlemen Road Sofa, trips can be as comfortable as the bike is stylish. 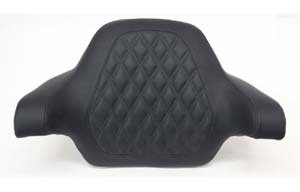 The unique split cushion design, which separates the lumbar support from the seating platform means no more hot spots or tail bone pressure. Contours have been painstakingly refined to provide the lowest and most comfortable ride possible. Get show bike appearance and touring comfort at the same time. Designed for top-of-the-line touring rigs, each Road Sofa can be made to order to your specifications. 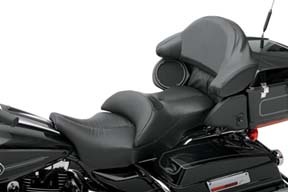 Cradle yourself in comfort with SaddleGel, an air-adjustable rider's backrest, and the unique "Split-cushion" design. 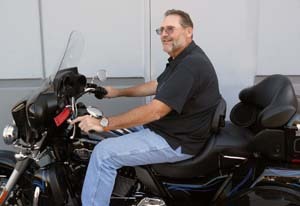 Select from genuine leather, plush velour, black vinyl or Saddlehyde covernings, in black or colors to match your bike. 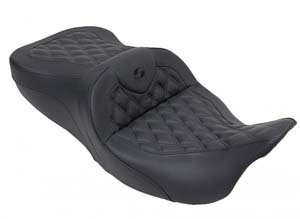 Split-cushion design eliminates the "hammock" effect of conventional saddles. 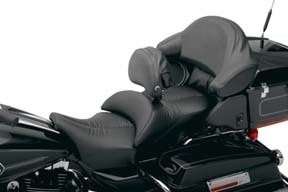 Driver's backrest is adjustable forward-back, up-down, and has a self-inflating air bladder inside. Seats can be ordered to fit your exact height, weight, leg length and riding style at no extra charge. Each Road Sofa is shipped complete with it specially reinforced base plate, ready for immediate installation. You need only the tools in your bike's tool kit and about 15 minutes. 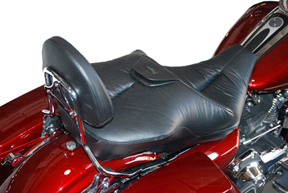 Matching Passenger Backrest Covers complete the custom look for the passenger backrest/trunk. Speaker covers available. 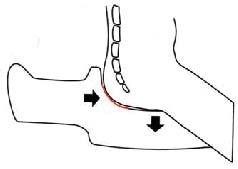 Shown at right with optional studs and colored welting. 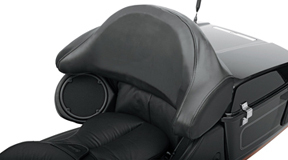 Adjustable Backrest hits another milestone for comfort! 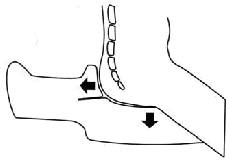 The internal bladder automatically fills when the valve is pressed to adjust both the thickness of the pad as well as the softness. Now the rider can change his riding position as he rides. 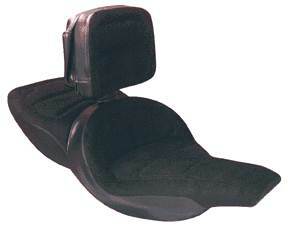 The backrest also folds forward and adjusts vertically. Comfort couldn't be easier! MY '97 through '07 Road Sofas are ~16" wide for Rider and ~15" wide for Passenger. 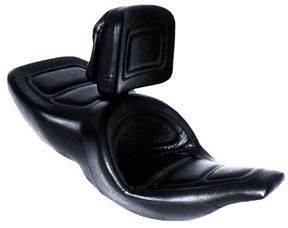 For MY '08 to current, the Road Sofa Deluxe rider width is ~18". Rain covers also available for seats with or without Driver Backrest. Now with Black Magic foam. Traditional seat foam is white, which can present a very unsightly blemish if the cover is torn or damaged even slightly. Black Magic foam maintains its black consistency throughout, while exhibiting the same durometer settings and comfort level as previous foam. Difference between Road Sofa and Explorer: The Road Sofa lumbar area is slightly leaned back as compared to the Exporer seat. The Explorer seat give you a slightly more vertical upright seating position where the Road Sofa gives you a more relaxed seating position. 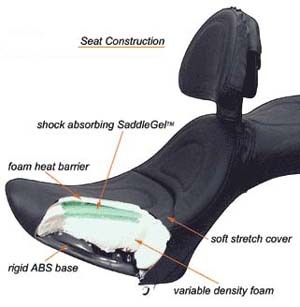 In comparison to the HD stock seat, the Road Sofa will position the rider about 1 to 1-1/2" further back and 1 to 1-1/2" down after the foam break-in period of 1,200 to 1,500 miles. RDSF-HT: Seat heater option.l Using dual five position controllers, the rider and passenger heat level can be dialed independently of one another for the ultimate in riding pleasure. The Split Cushion separates the seat surface from the lumbar support eliminating the "hammock effect by conventional seating. Saddlemen solves the annoying problem of repositioning constantly for a better riding position. Traditional "hammock" of stock and aftermarket seats creates blood flow restriction which cause discomfort & hot spots.